At The Web Development Group, we build websites for all types of brands and businesses. Sometimes we work with large organizations, like universities, and sometimes we work with smaller companies or local nonprofits. Web development for nonprofits will have a large influence on an organization’s success. Once chosen as one of the organizations to participate in CreateathonDC, the nonprofit’s representatives wanted to change from Blogger in order to have a better way of updating their website. Knowing that WordPress would more than meet these needs, we began discussing the different types of audiences that are attracted to the website, the important content to push out, and the overall design of the new site. It became apparent fairly quickly that the new site should be a dynamic one that allowed for images to easily be added to slideshows and throughout the website. At WDG, we have plenty of experience incorporating the best slideshows onto the websites that we develop. It was also important that the colors used on the website didn’t give off a “baby-ish” vibe. The representatives at DC Diaper Bank were interested in pushing out their message without coming off as being a “baby-focused” organization. 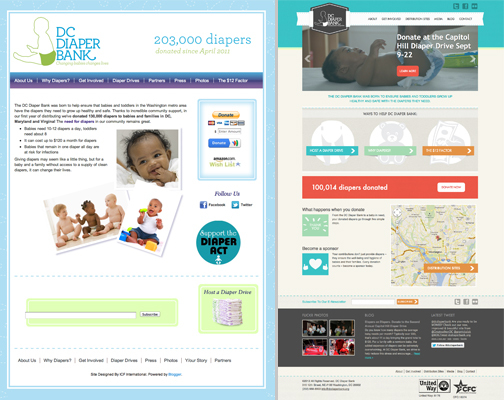 As one of the best DC WordPress development companies, we were excited by the challenge that this site was going to pose: how do you build a site about diapers without it looking like a baby-focused organization? The WordPress design team immediately had some great ideas. Obviously, using the traditional hues of pink and blue wasn’t going to work. Instead, we designed the site to incorporate saturated colors and infographics designed to attract a variety of users. The WordPress development team really took this website to new heights with their incorporation of a great slideshow on the homepage; they also incorporated a counter that increases with the number of donated diapers, as well as a map that allows members to see diaper pick-up locations. Oh, did we mention that it is also responsive? This site is something we are truly proud of and we are so happy to have been able to host such a collaborative event that brought the best designers, developers, and strategists in the area together. It seems improbable that we were able to do this all in 72-hours, but at WDG, we understand WordPress development and web design. Web development for nonprofits is something that we specialize in. We focus on the unique needs that smaller and larger nonprofit organizations often have. These sites are typically very specific with their needs and we enjoy helping the organizations hone in their message and goals for the new website. At WDG, we specialize in building custom designed and developed WordPress and Drupal websites. As one of the top web development firms in the D.C. metro area, we understand the importance of maintaining an in-depth understanding of the newest plugins and modules. If you are looking for a new online presence, get in touch with us. Although we are based in Alexandria, Virginia, we work with organizations and brands that are located in DC, Virginia, Maryland, and North Carolina.